For reasons which I will discuss later this week, I decided to skip my return flight to Frankfurt on Ryanair and book with Lufthansa instead. My PayPal information was entered correctly–LH’s website just wasn’t accepting it. 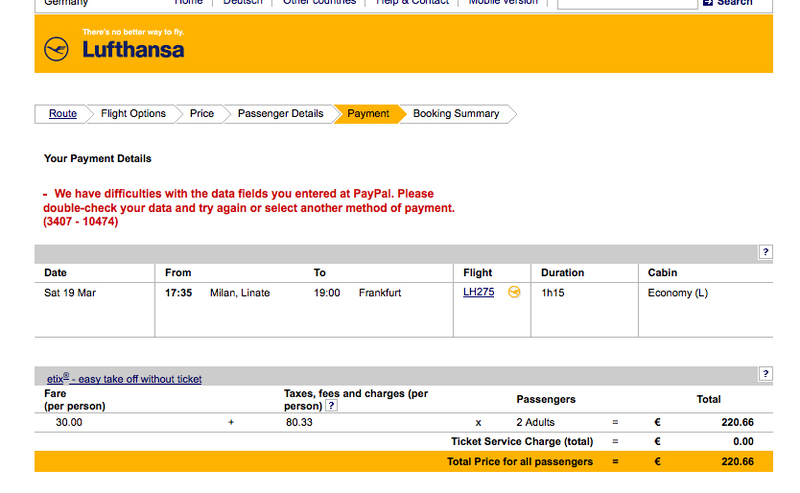 So I booked with expedia.de instead. Their booking fee was only a couple Euros and at least I’ll earn about 300 credit card miles for the transaction. People always attack United Airlines’ website as being buggy and error-prone, and it is, but it was oddly refreshing to see that even the carrier oft-heralded as the airline archetype isn’t immune from error messages–and cannot even spell out those error messages in a grammatically correct form!